It’s chlorine-free which makes it gentle enough for use for the entire family especially babies. It also doesn’t contain any dye or perfume. 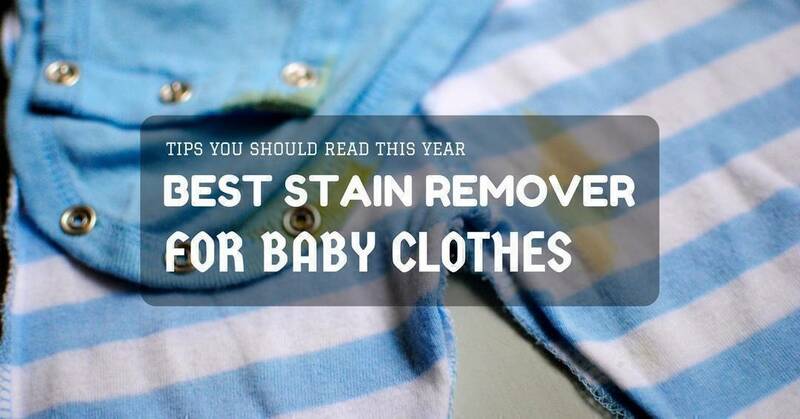 Aside from stains, it can also remove smells like those from breastmilk or formula spit-ups. From food to diaper leaks and even grass stains, it boasts of its ability to clean up anything. It doesn’t irritate even those with sensitive skin. You may still want to check with your paediatrician especially if your child gets allergies often. 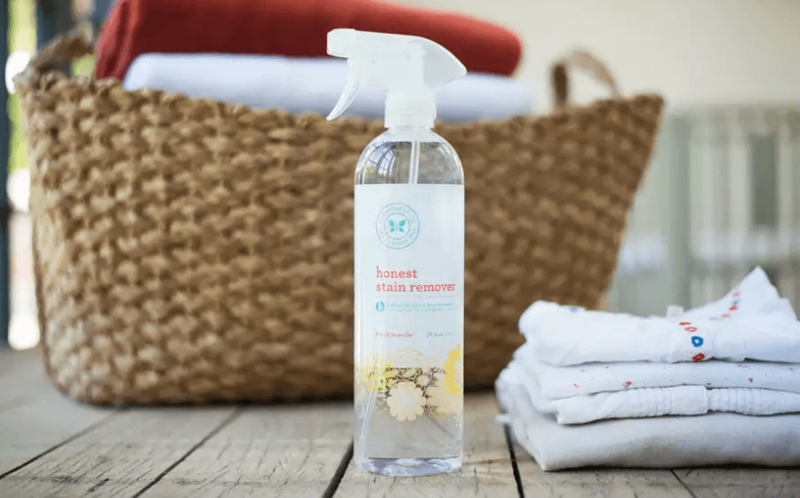 Most mums swear by its effectiveness even when used with set-in and hard stains (like soiled garments). There’s no stain it cannot handle – even clothes that turned yellow due to prolonged storage. So even hand-me-downs can look good as new. They received an “A” rating from the Environmental Working Group. It’s fragrance-free, but the clothes will still come out smelling clean. It’s a bit difficult to find probably because of the demand. You might need to use a stain brush so you can totally remove the hard marks. If you directly soak the clothing (without using any water or toothbrush to apply), it could fade the colour. According to its advertisement, it doesn’t affect the flame-resistant capability of your baby’s sleepwear. It’s also safe for all your colorfast fabrics (or any type), and the product doesn’t contain any harmful chemicals, so it’s gentle to use for your little one’s clothing. It even works fairly well at all temperature levels. It’s not just for kids’ clothes. The whole family can use it since it’s effective even with the most soiled clothing. It works great on food and poop stains. It can even remove coffee stains on chairs. As long as you follow the directions carefully and correctly, there will be no yellow marks visible after washing. One bottle lasts a decent amount of time. While it has a bit of a scent, it’s not too intense or overwhelming. It has a powdery smell. You need to use it for the treatment and removal of stains as soon as possible. Otherwise, you need to rub it in very well or wash a couple of times before you can remove any hardened stain. It’s not easy to find in stores. It’s a little more expensive than other brands. This product has an interesting composition. The first one removes tough proteins like grass and sweat. The second works for starch like tomato sauce from spaghetti. The last enzyme efficiently targets oil such as margarine or butter. It has something to combat whatever stained the clothing. It works well for ALMOST anything – even chocolate and saliva. If there are hardened stains, you can let it soak for a while. But for lighter ones, just spray, let it sit for about five minutes and then put it in the washer. Yes, it’s easy to use, and it’s foolproof too just as long as you follow all the directions thoroughly. It quickly breaks up grease which will come in handy if you have toddlers who are messing with everything they can find. It doesn’t fade the colour – not even bright ones such as red or green. It’s convenient because the product is in a spray bottle, it’s practically mess-free. It’s not readily available in stores and a bit difficult to find too. It may not work on old sweat marks on white shirts. The package doesn’t have a paper seal and might spill. It contains six plant-based enzymes which make it more efficient in removing the toughest of stains. It uses natural and non-toxic ingredients. It’s hypoallergenic and non-bleaching thus, it’s safe and gentle enough to use for baby’s clothing. It works well even on delicate fabrics, car seats, cloth diapers, linens and bedding. From watermelon to mud – it’s great at removing anything on the clothes without affecting or fading the colour or prints. It contains active but safe ingredients, and it doesn’t just remove the stain. It also includes odours, spots and residues. If it’s a tough stain, you might need to rub the solution well then wait for eight hours. But that’s better than having to discard the item. It’s safe for babies with sensitive skin – you may want to use it on your clothes too if you’re always cuddling. For stains which already settled in, you might need around two washes to remove it. If it’s too old or has already hardened, this remover might not do much. It’s not fragrance-free since it has a citrus smell – while not exactly unpleasant, it might be bothersome to others. Aside from the fact that the company didn't test it on animals, this product is also free of chlorine, dyes, fragrances, parabens and phthalates. It’s safe for all kinds of fabrics (even delicate kinds) and can remove the toughest and hardened stains and odours from any baby clothes. All ingredients are gentle and plant-based. There’s no chemical smell, so it makes you feel safe in using it even for newborn babies. It gets out all the stains and dirty scent even if it’s food, mud, grass or poop. It’s so powerful that it works well even on sheets. It’s eco-friendly and easy on the fabrics – no discoloration even on delicate items. The sprayer doesn’t release a fine mist. Instead, it sprays a powerful stream of liquid. You might end up getting splashed with or have some wasted product since it bounces off the fabric. It’s probably due to the thick liquid consistency because it still does the same thing even if you use another spray bottle. Without any pre-treating, it might require a second wash.
You might need to work harder if formula milk caused the stain. There might be outlines left on white clothes. Sometimes, soaking in water overnight works but more often than not, it still leaves discoloration on the fabric. No matter what it is, there will always be spills or ‘accidents’ which is why you always need to prepare – whether it’s apple juice or squash, you should know how to handle it. Sometimes, it’s tempting just to throw away the item (I did this when the shirt was beyond saving) but once your favourite piece of garment gets stained, trust me, you’d do anything to make it look new and clean again. Don’t let the stain dry. If it starts drying, it will be much harder to remove no matter what you do. Therefore, the moment you notice any stain especially poop, immediately soak in a tub of cold water – the longer, the better, so the stain won’t settle. If it has already hardened, you can soak it in warm water with detergent to at least help in removing whatever stained the fabric. I won’t guarantee that this can accomplish much, but you can at least try. It also depends on the severity of the stain. Let the sun help you out. Again, this is provided you’ve already taken most of the stain from the clothing. Exposing it to the sun for an hour or two can lighten it and make it less noticeable. It is mostly useful with yellowish milk stains. Keep in mind, however, that this can also fade those dark, bright colours. So if you don’t want that red shirt to turn into light orange, then you might consider another option. Use a stain remover. If all else fails, go to that one product designed for the sole purpose of removing stains. Make sure that’s it’s gentle enough for your baby’s clothes. Some may contain harsh chemicals and ingredients, and you don’t want those products anywhere near your little one’s belongings. A regular detergent can be used to clean the child’s clothing as long as they don’t have sensitive skin which may be prone to allergies. Sometimes, this is enough to remove the pureed pumpkin or other food on the fabric. But if not, there are still other means. > Create a mixture of water and the stain remover and mix until it’s a thick, paste-like consistency. > Use a toothbrush to scoop it and apply directly to the stain. Let it sit for about five minutes so it can do its magic. > Put into the washing machine and laundry as usual. If the stain has dried and is already a few days old, you can soak in a tub filled with hot water and the remover. Just let it sit for around 24 hours. You will notice that the stain looks faint. Designate an area where you can stock all the stained items. What I like to do is have a whole bucket and use it solely for garments with spit-ups or food stains. If I find my hands full at the moment and cannot immediately attend to the stained clothing, I would just fill it with water and soak the item. Of course, you’d want to separate the white clothes from the coloured ones (especially red). While these are all suitable solutions, remember that prevention is always better than cure. So if your little one is more prone to getting stains from their foods, you can make them wear a bib. I prefer the plastic bibs with pockets because cleaning is a breeze. 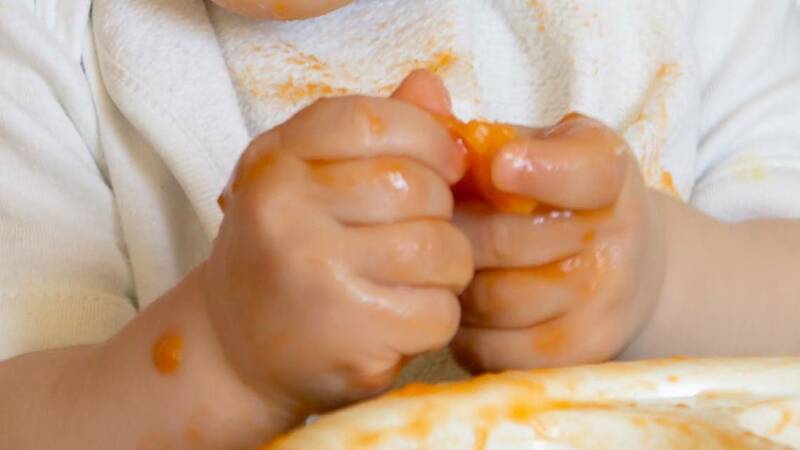 When my son is about to eat something messy (like pumpkin puree or pasta), I use the waterproof, long-sleeved bib so that nothing will go to my little boy's clothes. There are home solutions for stains like vinegar and baking soda. And though there are mums who swear by it, it’s not always effective. Sometimes, you end up with yellowish colour on the shirts, and that’s a big bummer. So I rounded up some of the best products you can find on the market. With plenty of things to do and so little time, the last thing mothers want is to deal with removing tough stains. The products mentioned above will help you with the task, so you spend fewer hours doing laundry and more with your baby. Also, you wouldn’t be stressing out about every small thing like kids playing in the grass, getting watermelon or pumpkin stain or their shirts – you know that cleaning the clothes will be a breeze. The clear winner for me here is the OxiClean Baby Stain Fighter. The cons aren’t deal-breakers because those are things you can control if you only follow the instructions carefully and thoroughly. Another thing is, using a brush for tougher marks isn’t that big of a deal. What’s your favourite product among all these?